Today Beautiful Strange and Impulsive Hearts is pleased to announce the release of their first full-length album. Sorry in the Summer will be available on vinyl and digital download from Beautiful Strange on February 26th. The band picks up where recent revivalist acts like Dum Dum Girls and Best Coast have left off, adding just a hint of indelible Midwestern sadness to the neo-girl group garage rock sound. Sorry in the Summer is available for purchase via Beautiful Strange Bandcamp, select Chicago record stores and directly from the band. "I’ve been traveling around Europe for the past 6 months, singing my songs for anyone who will listen (and sometime to people who don’t). While I’ve been here, I’ve slowly been getting used to being so much closer to the world-changing events that we see on the news every day. I haven’t been able to get used to being so helpless in the face of so much pain and suffering so close to home. I’ve watched some politicians do great things to help suffering and vulnerable people in the midst of the Syrian refugee crisis. And I’ve watched New Zealand's Prime Minister, John Key, minimise and deflect and avoid taking stepping up to help in this truly global humanitarian situation. I feel insignificant and powerless in the face of atrocities and gross displays of inhumanity; I feel angry at the cold, unwelcoming faces of those who are in a position to help. This is my own small way of helping; I offer this new track, ’No Civil War’, as a Pay What You Want download. After the bombing of the Medecins Sans Frontieres Kunduz Trauma Centre, I decided that all the proceeds from the download of this track, ‘No Civil War’, will go to MSF to help support them in their humanitarian efforts in Syria, Afghanistan, Yemen and all over the world. I hope that you’ll take the time to download this track, and give something: even small amounts help these incredible medical professionals do their selfless and lifesaving work despite corporate and governmental indifference and indecency. I hope also that you’ll help me to spread the word, so that more people can do the same. Luckless is Ivy Rossiter, originally from New Zealand but currently splitting her time between London and Berlin. Vindication Blues is Luckless' second full length album and this is her first vinyl release. An album that draws inspiration from 90’s heroes PJ Harvey, Mark Lanegan and Sparklehorse, while reaching out to contemporary touchstones The Kills and Warpaint; the music is poised somewhere between the ethereal haze of indie folk and the propulsive drive of alt-rock, building on 2012’s self-titled debut, with a record of great emotional breadth and musical scope. Today brings an exciting announcement from Beautiful Strange, a vinyl release of Luckless' wonderful LP Vindication Blues. Vindication Blues is released on vinyl exclusively via Beautiful Strange on November 27th 2015. Listen to the album via SOUNDCLOUD or SPOTIFY. Vinyl is available to order now through Beautiful Strange and in stores soon. To coincide Luckless will embark on a European tour throughout November and December. Full UK tour dates below. "Vindication Blues... is the sound of the natural world coming through the artificial overlay of society. Raw, heartfelt, primal emotions crack through false politeness, like flowers cracking through concrete, revealing something real and powerful amidst the desolation of superficiality." After a couple of production delays out of our control. I'm delighted to say that The Sinclair Sinclair's debut LP Breaking The Waves is now shipping via the Beautiful Strange Bandcamp site or Shop. Exiles wonderful EP I've Got Secrets Too is shipping now on cassette via our Bandcamp and Store. Take a look at the picture below and pick your favourite colour (just 50 of each available). Beautiful Strange is delighted to introduce you to a new member of the family! 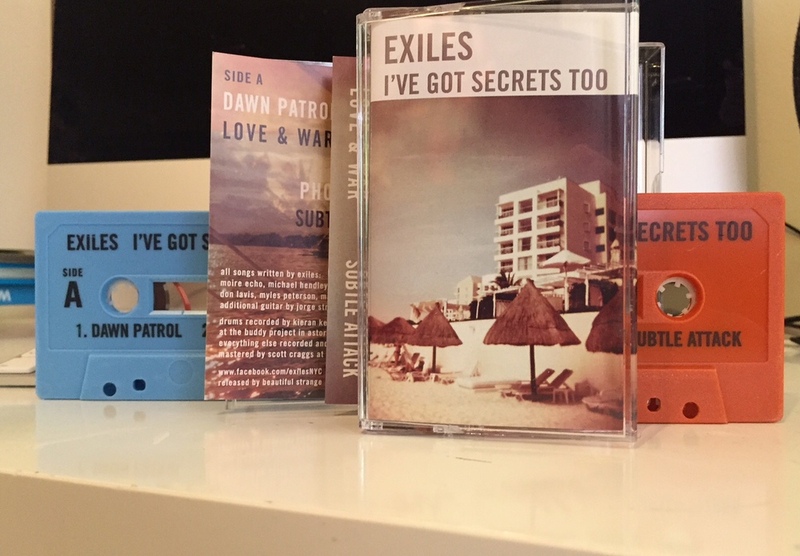 ‘I’ve Got Secrets’ is Exiles’ second EP and contains four new tracks available via limited edition cassette tape (50 on Rustic Orange and 50 on Pale Blue) on August 28th. The EP is also released by Dufflecoat Records on CD. Full details and tracklisting HERE. Listen to the beautifully crafted lead track ‘Dawn Patrol’ over on SOUNDCLOUD. DUE IN STOCK FOR RELEASE ON AUGUST 21ST ON LIMITED WHITE VINYL.